I was excited to hear that PC World picked up an article that Ken Banks (founder of kiwanja.net, and the man behind FrontlineSMS) wrote, titled, “Witnessing the Human Face of Mobile in Malawi.” If you’re interested, you can read it here. Verona Kapagawani, who lives in TA Mavwere, alerted the hospital that a patient had run out of his meds. A nurse at the hospital, familiar with the patient, responded that he should fill his prescription (he has chronic congestive heart failure) as soon as possible. Verona responded, noting that she counseled the patient. He wasn’t feeling well enough to travel, so she came to the hospital to pick up his drugs. While chatting with the nurse, Verona charged her cell phone. I ran into another CHW, Benedict Mgabe, at the hospital today. He’s the chairman of the Community AIDS Committee, and he’s texted me every day. With a smile on his face, he shook my hand and said, “This is a very good program! It is really helping us a lot.” Those short sentences confirmed that I want to have longer conversations with the CHWs, to gather their reactions. We’re using the pilot group to contact the next wave of CHWs, another 10 volunteers, to be trained and given phones Monday morning. Above, you’ll see Alex (a nurse, who does most of the Home-Based Care community work) and Grace (who coordinates the ART program) using FrontlineSMS to text the group. I had a long discussion with Dr. Mbeya, the medical director at St. Gabriel’s, about making very definitive links between the hospital and the CHWs’ activities. As the project grows over the next weeks, we’ll create guidelines for reporting and follow-up, based on the specific program. For example, the hospital has a lively prevention of mother-to-child transmission (PMTCT) program, aimed at reducing vertical transmission of HIV. We’ll develop a protocol for utilizing the CHW network to follow up on mothers who’ve missed their appointments, and the CHWs will provide a link to the communities’ pregnant population. I’d love to get some other perspectives on this. Sending good wishes from Namitete. I have to believe today’s events were endowed with the elements of a promising beginning. The first phones are in the field! Before I get too ahead of myself, let me explain what’s put me in such an optimistic mood. We called the chairs and vice-chairs of the volunteer committees (Community AIDS Committee, Village AIDS Commitee, and the People Living With HIV and AIDS [PLWHA] support group) for a meeting at 9 am this morning. The came in together, some on bikes, most on foot. Considering that some traveled over 50 miles (that’s most definitely an underestimate), this was quite the event. I had been up since 6:00, testing phones and FrontlineSMS, and I was eagerly awaiting the group – equipped with Cokes, Fantas, lemon cookies and a broad smile. I know that times are difficult, but we must make improvements step by step. Do babies just start to run? No, they start just sitting. Then, when they see something beautiful, they wiggle their stomachs and arms, trying to reach for it. Soon, they can crawl; then they start walking. We can take steps forward, together. This is a pilot – we are learning new vocabulary today, too! You are the first to do this. It is not enough to try. We must do it. After that poetic introduction, the matron told them they’d be receiving cell phones. This news was greeted, almost immediately, with cheers and applause. *A disclaimer: That’s Alex’s handwriting. 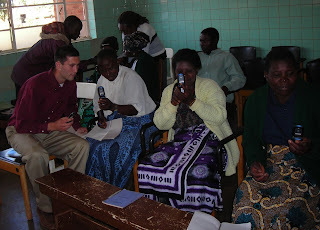 We had an outstanding time teaching the CHWs how to use the phones. It started with group chants of, “Messages! Compose Message! 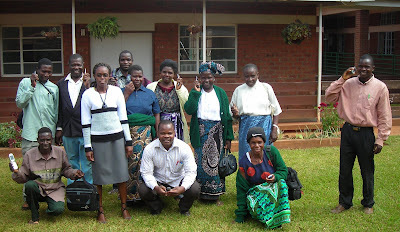 New Short Message!” The majority of the CHWs hadn’t texted before, so we spent some time teaching them – by the end of the session, each of the health workers flawlessly typed ‘St. Gabriel’s Hospital,’ apostrophe and all. After a few hours of rigorous concentration and seemingly inexhaustible patience, we took a break for snacks. During break, we discussed logistics. The CHWs all claimed to have access to electricity. It seems that most will have to pay 10 kwacha (a few cents) to use the nearest electricity hub. 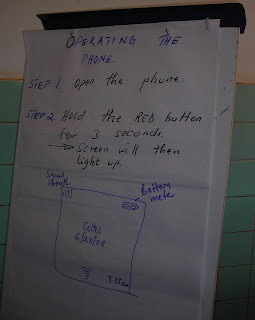 When it’s necessary, they (or someone from their village) will travel to the hospital to recharge the phone, free of fees. This isn’t altogether rare, as the CHWs often accompany patients to the hospital. The frequency and type of communication the CHWs will maintain with the hospital will depend on the program the CHW is enrolled in. For example, those involved in TB drug adherence monitoring will alert the hospital when a patient is deviating from a regimen. Similar expectations were agreed upon for the ARV monitors. Home-Based Care volunteers will be messaged when a patient needs to be traced or if a follow-up is needed. Those involved in organizing peer support groups will use the system to coordinate meeting times and locations. With any luck, and plenty of commitment, they’ll be a working network of CHWs, with St. Gabriel’s H ospital as a coordinating agent. Before leaving, the group sent a sample text to the hospital’s number, and we showed each CHW their respective message as it popped up in FrontlineSMS. It was an animated scene, for sure. I recorded some of their information (name, number, village, and respective program), checked their starting units, and let them loose on the catchment area. Needless to say, I’m looking forward to tomorrow, and the possibility of the first messages trickling in. With a smile on her face, Verona asked me, “So, when can we start messaging?” A few of the CHWs joined me in responding, “Now!” As they started home, I could see they were exchanging phone numbers. I’m very happy with how things have started off. Almost immediately upon arriving, I pitched the communications program at the hospital’s management meeting. Most of those in attendance I knew from my previous stay in Namitete, and they seem happy to have me back. I’ve discovered that props are useful. 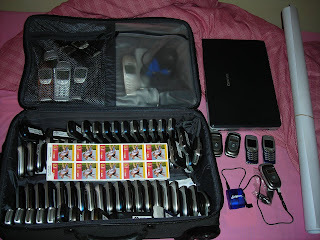 So, I lugged my suitcase into the conference room, revealing about one-hundred cell phones. I also flopped around the ~100,000 units of communication credit I’d purchased at the airport. 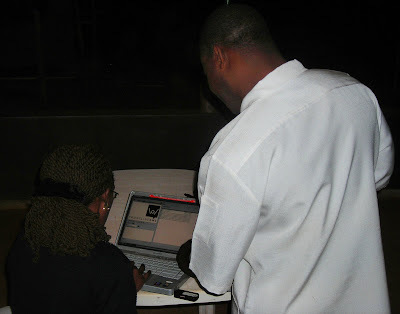 After a quick demonstration of FrontlineSMS, ideas started flowing – and not just in one direction. I’m finding that ideas developed in the US regarding the program’s potential usefulness (e.g. 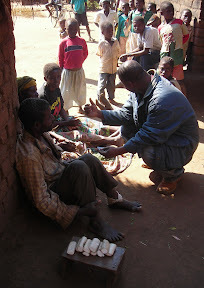 patient follow-up, TB and HIV drug adherence monitoring, fielding the community’s medical questions, etc.) are really resonating here. After a bit of grudge work (putting in SIM cards, implanting the initial Celtel units, recording numbers, testing FrontlineSMS, etc.) we are ready to start the pilot. I spent the day in Lilongwe, trying to find decent maps of the area the CHWs hail from and work in. First, I tried the District Health Office. No maps, but the doctor coordinating health information for Lilongwe was very interested in the communications initiative – specifically, the possibility of scaling up to cover the entire Lilongwe district. In an attempt to stay ambitious but grounded, I kindly left her my e-mail and other contact information. Next, I headed to the Department of Surveys. Like the government hospitals, the state buildings are treacherous. Quite literally, I had to guess which alleyway to wander down – I was finally consoled by a piece of paper, duck-taped to a door, which read, “Digital Mapping.” I put in an order for TA Kalolo and TA Mavwere (don’t ask me what ‘TA’ means, because I have no idea), and was told to come back in a few hours. After a few bribes (‘fees’) and hitchhiking excursions, I had my maps (below). I’ll leave you with an image of some of the goods. Before the week ends, I am creating some step-by-step instructions for operating the phones and FrontlineSMS, which Alex is going to translate into Chichewa tomorrow. I’ll probably fall asleep testing the hand-powered, wind-up chargers – the motor is strangely soothing. When you get the chance to read through the updates here, leave me your thoughts. Any and all comments are welcome. All the best! Thanks, ahead of time, for reading.